1. Place coins, keys and small metal items in your carry-on. If your cell phone isn't being used as your boarding pass, put it in your carry-on bag. 2. Place liquids, aerosols and gels in a clear, 1 L resealable bag. One bag per passenger to be placed in the bin. 3. Unpack your laptop computer and place it in the bin. 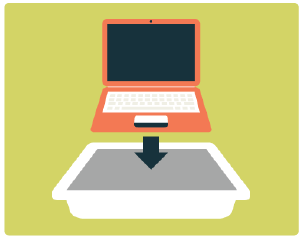 Place the laptop width-wise in the bin with nothing on top of it. 4. Remove outerwear, including bulky and winter coats and place them in the bin. Pack your bins neatly. This helps the screening officer see the X-ray image more clearly.